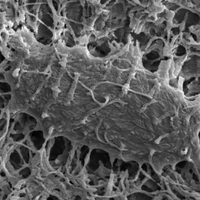 Scattered throughout skeletal muscle, the muscle spindles are composed of connective tissue capsules containing bundles of specialized muscle fibers called intrafusal fibers. Wrapped around the middle of these fibers are the spiral terminals of a large sensory neuron, the type Ia axon. To one side of these spiral terminals, collectively called the primary endings, are the secondary endings, the terminals of a smaller sensory neuron, the type II axon. Both types of nerve endings serve as stretch sensors that send feedback about muscle contraction and length changes to the brain. © CATHERINE DELPHIAAt rest, muscle spindles generate a trickle of nerve impulses. 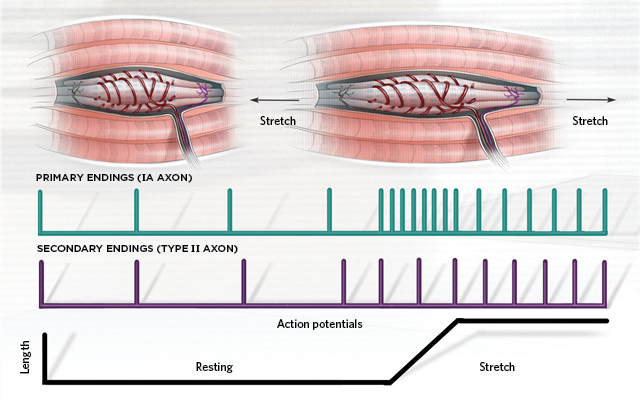 Stretching the muscle raises the number of nerve impulses from both the spindle’s primary and secondary endings. Impulses in the primary endings signal both the rate of change in muscle length and the length change itself. Primary endings are therefore both movement and position sensors. 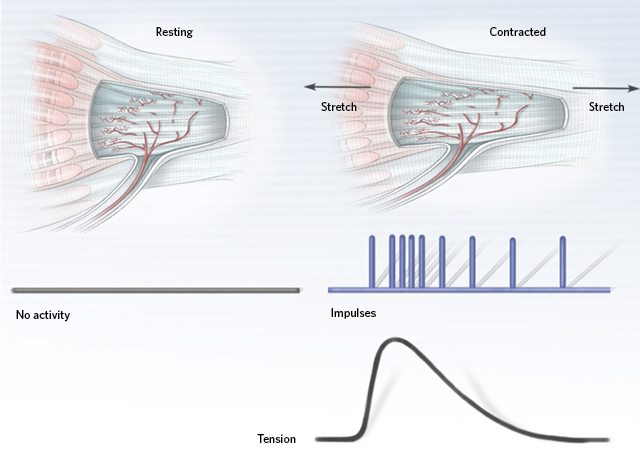 This sensitivity to the rate of the stretch makes the primary endings responsive to muscle vibration. The secondary endings respond only to the length change, making them position sensors; they are vibration-insensitive. Tendons attach muscles to bones. 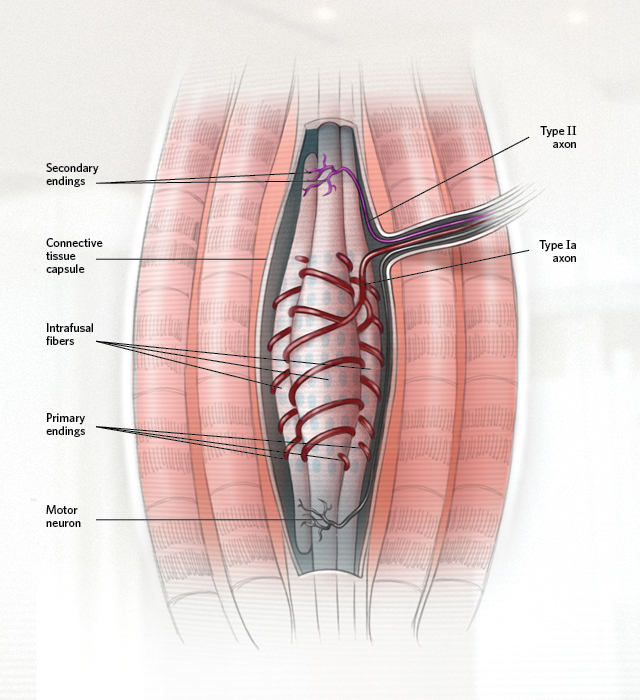 At the junction between muscle fibers and tendons lie the tendon organs, small bundles of tendon strands enclosed within a connective tissue capsule, similar to that in muscle spindles. The axon of a large sensory neuron, the type Ib axon, penetrates the capsule and terminates on the collagen strands. Each strand is attached to a single muscle fiber. 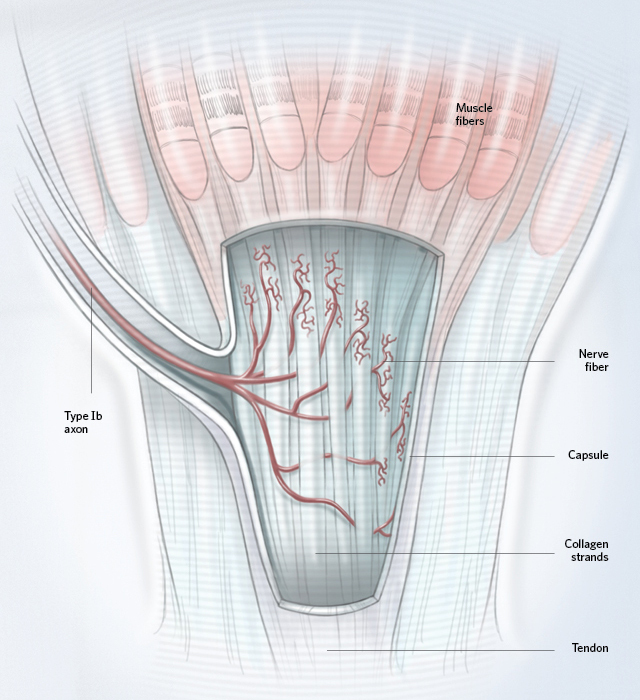 In a typical tendon organ there are 10–20 innervated tendon strands with attached muscle fibers. © CATHERINE DELPHIALike muscle spindles, tendon organs are stretch sensors. 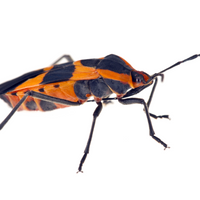 They are particularly sensitive to muscle contraction. In the resting state, tendon organs are silent. When the muscle fiber contracts, it pulls on the tendon strand and stretches it. This stretches the nerve ending of the Ib axon to generate nerve impulses. During a contraction, as muscle tension rises and then falls, the pattern of impulses increases and then decreases in frequency and number.